Jennifer was born and raised on the North side of Chicago. She began golf when she was 7 years old. At 12 years old, she began working with Todd Sones who became her primary swing instructor leading to many junior titles and success. For two years, she attended Adlai E. Stevenson High School, where she led the team to the Illinois State Finals for the first time in school history. For her last two years of high school, she attended the David Leadbetter Golf Academy at IMG Academy where she competed regularly on national junior tours including the AJGA, FCWT, IJGT & Hurricane Tour. As a result of a successful junior golf career, she was recruited to play for the Rollins College Women’s Golf Team. After graduating college, Jennifer worked in advertising and marketing. 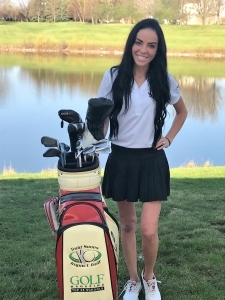 After a few years without golf being the core of her life, she attended and graduated from the Golf Academy of America in Phoenix, Arizona to pursue her passion and ultimate goal of becoming a golf instructor. Jennifer spent her summer before graduating, apprenticing with Todd Sones and his instructors, completing the 500 observation hours necessary to instruct at the Todd Sones Golf Academy. Any free time Jennifer had while attending the Golf Academy of America was spent observing well known instructors, such as Mike and Sandy Labauve, Mark Winkley, and Char Carlson.